Our species long lived on the edge of starvation. Now we produce enough food for all 7 billion of us to eat nearly 3,000 calories every day. This is such an astonishing thing in the history of life as to verge on the miraculous. 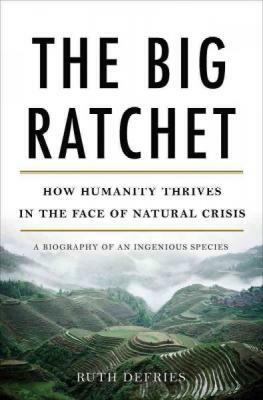 The Big Ratchet is the story of how it happened, of the ratchets--the technologies and innovations, big and small--that propelled our species from hunters and gatherers on the savannahs of Africa to shoppers in the aisles of the supermarket. The Big Ratchet itself came in the twentieth century, when a range of technologies--from fossil fuels to scientific plant breeding to nitrogen fertilizers--combined to nearly quadruple our population in a century, and to grow our food supply even faster. To some, these technologies are a sign of our greatness; to others, of our hubris. MacArthur fellow and Columbia University professor Ruth DeFries argues that the debate is the wrong one to have. Limits do exist, but every limit that has confronted us, we have surpassed. That cycle of crisis and growth is the story of our history; indeed, it is the essence of The Big Ratchet. Understanding it will reveal not just how we reached this point in our history, but how we might survive it. Ruth DeFries is Denning Family Professor of Sustainable Development and Chair of the Department of Ecology, Evolution and Environmental Biology at Columbia University. A recipient of the MacArthur Genius Fellowship, she lives in New York City. "Engaging and optimistic...a book that considers human progress not as an ever-ascending scale but as a sort of fugue with a repeating theme."